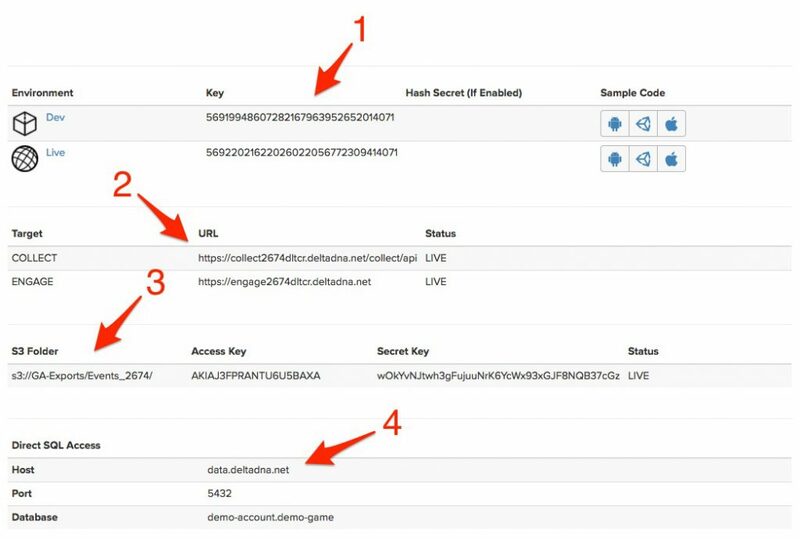 The Game details page contains all the details of your game, it’s environments and connection points in to the deltaDNA platform. There is a separate page for editing your game details and configuring receipt verification, Geo-Location, benchmark sources etc. (1) Environments – this section contains environment keys for each of your data environments. Please note: the environment keys are different and they should be used in the SDK Start() method or the URL you post data to from the REST API to ensure that your data is directed in to the correct environment. Developments and QA data should be sent to your DEV environment and only live production data should be sent to your LIVE environment. Clicking on the SDK icons in each environment will reveal some boilerplate code that can be used to integrate and start the SDK. If you have event hashing enabled on your account the hash secret will also be displayed here. (2) Target – these are the unique URLs that you should POST your Event data and Engage requests to. If you are using any of the SDKs you should populate the Start() method with these values, or use the boilerplate start code mentioned above. (4) Direct SQL Access – these are the connection details that you should use to connect third party ODBC compliant database tools like DBeaver, R, Tableau, Excel to the deltaDNA data warehouse.